Rely Tampons Box, Proctor and Gamble, 1980. 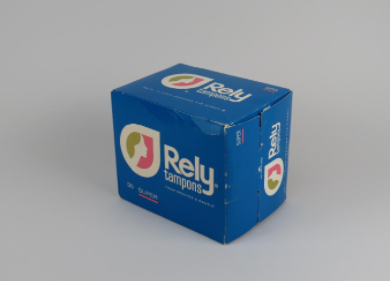 In 1980, Proctor and Gamble released the Rely tampon, part of the continuing effort to improve the performance of feminine hygiene products. They introduced new tampons containing carboxymethylcellulose and compressed polyester beads. These materials were designed to absorb up to twenty times their own volume in blood, so they did not have to be changed as frequently as other tampons. Like other tampons, however, Rely tampons did not undergo extensive testing for safety.